Cape Cod is an arm-shaped peninsula on the easternmost portion of Massachusetts. It is a well-traveled tourist and vacation area, featuring miles and miles of beaches, natural attractions, historic sites, art galleries and many four-star restaurants. The area is also very popular amongst antique enthusiasts and people who enjoy bed and breakfasts. Many opportunities exist here for golf, fishing and other outdoor activities. The town of Provincetown, at the very tip of the peninsula, is the site of the first landing of the Pilgrims. towns nearest to the bridges that lead to Cape Cod. towns near the elbow of the peninsula. towns at the end of the peninsula and location of most of the Cape Cod National Seashore. Cape Cod and The Islands are made up of a diverse array of cities, towns and villages. The towns closest to the mainland offer everything from great antiquing to dining out at some of Cape Cod's finest traditional restaurants. 41.741111111111-70.5994444444441 Bourne — Features the Cape Cod Canal. 41.758888888889-70.4944444444442 Sandwich — Many, many antique shops and much else. 41.551388888889-70.6152777777783 Falmouth — A harbor town with great beaches and great fishing. 41.5267-70.66314 Woods Hole — Village within Falmouth with tons of shopping and dining options, not to mention ferry connections to Martha's Vineyard. The commercial center of the Cape is at the "bicep" of the peninsula. 41.672-70.3586 Barnstable — The commercial and transportation center includes seven villages, each with its own unique and significant cultural and historical qualities. Barnstable was the first place to be settled on Cape Cod; in 1639. Several Crocker family houses and farms from that period still exist today. 41.701416666667-70.3030555555567 Barnstable Village & West Barnstable — on the north side and has a working harbor and several small beaches. The West Barnstable Train Station is the only operating train station left on the Cape. 41.645888888889-70.3466944444448 Centerville — on the south side, is mostly residential and has beautiful beaches. 41.616666666667-70.4369444444449 Cotuit — a village on a peninsula on the south side with several small beaches. 41.652777777778-70.28333333333310 Hyannis — the town's commercial district including town offices and several shopping malls. Hyannis has a fine harbor and is also a fishing village. The harbor provides ferry access to the islands. The regional airport and bus terminal are also here. 41.628333333333-70.38694444444411 Osterville & Marstons Mills — on the south side, is residential, with a charming town center and a coast that includes inlets and harbors for boating and fishing. These towns near the elbow of the peninsula are filled with history and ocean scenery. You'll find them great for family-oriented activities such as beaches, museums, waterfront activities, fishing and boating. 41.76-70.08333333333315 Brewster — historical home of many sea captains. 41.681944444444-69.96027777777816 Chatham — A unique setting with harbors, barrier islands, seals, and a walkable center. 41.789722222222-69.99027777777817 Orleans — A charming town of shops and beautiful scenery. You'll find the Outer Cape at the end of the peninsula. This scenic area comprises much of the Cape Cod National Seashore, and is home to some of the most popular beaches in the United States, such as Coast Guard Beach and Nauset Light Beach in Eastham. 41.83-69.97444444444418 Eastham — home to beautiful ocean beaches, kettle ponds, and lighthouses. 41.936-70.0319 Wellfleet — A beautiful harbor town with diverse and protected Cape habitats. 41.993333333333-70.05027777777820 Truro — Dramatic cliff dunes and Cape Cod Light. 42.058333333333-70.17916666666721 Provincetown — a "must-see" destination for its art scene, shopping and beautiful beaches. Once made wealthy by whaling and other maritime trades, the Islands remain upscale destinations today. Folks will pay a pretty penny to experience their undeniable charm and natural beauty. By combining this island idyll with a chance for celebrity spotting, many visitors feel as though a potent spell has been cast upon them. The only way to break witchery? Why to return again and again, of course. 41.837222222222-69.9727777777781 Cape Cod National Seashore — These 40 miles of Atlantic coastline are some of the most beautiful in the country. Cape Cod is truly a unique place. Even the weather seems to have a distinct feel. In the summer, cool mornings of mists tasting of salt turn into warm beach days. The cape extends from the main eastern coast of the United States, where temperatures tend to be warmer compared to other New England regions. This is because it lies closer to the Gulf Stream, a warm ocean current flowing from the Gulf of Mexico to the Maritime Provinces of Canada. The warmer temperatures provide a longer season for tourist activities like golf and fresh water fishing. On the other hand, coastal storms can be brutal, battering the exposed peninsula with high winds, thundering ocean waves and, in winter, two or three feet of snow in a Nor'easter. That is how Cape Cod was, and is, shaped. Similarly, Cape Cod's people have been shaped by waves of population growth. English colonists, Portuguese fishermen, beatniks and artists and retirees have each constituted a wave that broke over the Cape's population and made it stronger and more diverse. Every year the strongest wave of all washes over Cape Cod for three months and then ebbs out again: tourists. The wave brings nearly a tripling of the population. Seasonal businesses open and fill starting in April. Year round haunts slowly come alive. On July 4 weekend the Cape Cod party is in full swing until Labor Day. Then the tide washes out slowly as the cool air arrives. The locals breathe a sigh of relief. Beautiful Cape Cod is theirs again. Mostly. If you don't need to swim or lie on the beach, the shoulder seasons of late spring and early fall are an excellent time to visit. Both times have their unique charms, lower prices and considerably more peace. The commercial, busy Cape Cod gives way to its simple, relaxed and charming self. If you demand no more than peace, solitude, and quiet (say to paint or write), even a winter on Cape Cod could be just what you need. While there are a bevy of transit choices available to the arriving traveller, only one option is likely to make sense for you and your plans. Driving is of course the most popular, but the freedom it provides is balanced out by the specter of snarling traffic. It's possible to avoid the worst jams by driving off-peak hours. If you're headed to the islands, cars aren't ruled out entirely, but there will certainly be a pricy ferry or plane ride in your future. Finally, there are great public transit connections to both Provincetown and Hyannis. You won't be able to explore much further afield, but either spot makes a fantastic weekend getaway. Since the Cape Cod Canal severs this region from the mainland, visitors arriving by car must cross one of two bridges to alight upon the Cape. Think carefully about the time of day you cross! From Boston take I-93 south to Route 3 south to the Sagamore Bridge. From Providence you can reach the Bourne Bridge by taking I-95 north to I-195 east to Route 25 south. Traffic is heavy in the summer, heavier on weekends, and heaviest on national holidays. During the busy summer season try to get over the bridges before 9AM or after 7PM. Traffic conditions are constantly changing, so use your favorite smartphone app for up to the minute alerts. The majority of services here are ships plying their trades between Boston and Provincetown. These run constantly in summer, dropping in frequency during shoulder seasons. However, there are other options if you do a little planning. None of these ferries can accommodate cars, please see the listings under Get around below. All ferries will be tourist class, and will see you travelling in comfort and style. Each ship is Coast Guard approved, natch. But more importantly, they all have bathrooms, serve alcohol, and have some kind of food available. As these options are for tourists, remember that these ferries only run from around Memorial Day to around Labor Day. Check each company for their specific start and stop dates. The only exception here being the Cuttyhunk ferry. It's the only way on or off the island, so it runs all year long to provide access for residents. Boston Harbor Cruises (BHC), One Long Wharf (T: Aquarium), ☎ +1 617 227-4321. 5AM-midnight, varies. Step aboard the Salacia, and within 90 minutes this large (and fast!) catamaran will whisk you away from downtown Boston drop you in Provincetown. Runs seasonally May 16th through Oct 14th. Offers 1-3 trips per day depending on the season. $61, $93 round trip, bikes +$9 each way. Bay State Cruise Company, ☎ +1 617 748-1428. Roughly analogous to BHC but also offers a slower, more affordable ferry option. Runs seasonally May 16th through Oct 14th. Fast ferry: $61-64, $90-96 round trip. Traditional ferry: $30, $60RT. Bikes +$8. Seastreak, toll-free: +1 800-262-8743. This is kind of a "one day cruise" available from NYC to the Islands. Voyages depart from the Jersey Shore and pick up more folks in Manhattan before making the longer run to Martha's Vineyard, then finally continuing on to Nantucket. The trip from NYC to MV can take about 5 hours, and you're looking at over 8 hours for the full ride from NJ to ACK. Seastreak does offer an additional route from New Bedford direct to MV. These ferries are all seasonal, operating from about mid May to the end of October. One way NYC to MV $175, other options range from $40-330. Vineyard Fast Ferry, ☎ +1 401 295-4040. Departing Portsmouth, RI for Martha's Vineyard, this fast ferry operates seasonally and takes about 90 min to make the trip. It's a great option if you're flying into Providence. $56-104, parking: $10/day. Captain John Boats, ☎ +1 508-746-2643. While they only offer one trip per day in season, you can make the run to P'town from here in only an hour. This company runs out of Plymouth and offers competitive pricing. $35, $55 round trip. Bikes: free. Cuttyhunk Ferry Company. Running year round, this smaller ferry accommodates 150 people and is the only way to reach the town of Gosnold on Cuttyhunk Island. Two trips per week in winter are ramped up over the season, peaking at 2-3 trips per day in summer. This ferry departs out of New Bedford $28, $45 round trip. Parking $15/day. Two bus companies serve all Cape Cod destinations. Schedules change depending on the exact day and time, but you can generally expect to find at least one departure per hour. Almost all destinations are found closer to the mainland along the Upper and Mid Cape. Convenient if you're trying to catch a ferry, less great if you're interested in seeing the Cape Cod National Seashore. Infrequent busses stopping there on their way to Provincetown do exist, but you should really consider taking a ferry instead. The views are amazing and you'll avoid traffic delays to boot. Plymouth & Brockton (Street Railway Co), ☎ +1 508-771-6191. Hourly departures from Boston's South Station and Logan Airport to Sagamore, Barnstable and Hyannis. They also offer four round trips daily from Hyannis to Provincetown and several other lower and outer Cape towns during the summer. After Labor Day, this is cut to two trips past Hyannis per day, mostly used by down Cape residents heading to Logan. $19 one way, $34 round trip for South Station, $25 one way, $45 round trip for the Airport. Peter Pan Bus Lines, toll-free: +1-800-343-9999. Peter Pan is like New England's version of Greyhound. Service to Bourne, Falmouth, Barnstable and Hyannis from Boston, Providence (both the downtown bus terminal and T.F. Green Airport) and the Port Authority Bus Terminal in New York City. Cape Air is the only real player in the region, although JetBlue now flies many of the same routes. Places like Hyannis (HYA IATA) and Provincetown (PVC IATA) offer a few connections to Boston and New York. While island airports Nantucket (ACK IATA) and Martha's Vineyard (MVY IATA) serve large amounts of revelers arriving during the warmer months. They offer more connections than you might expect. If you're finding the prices on these direct flights a little rich for your taste, look up fares into Boston Logan (BOS IATA) and continue on from there. If you're really desperate, look up T.F. Green Airport in Providence (PVD IATA). There are deals to fly here every once in a blue moon. Your one option here is the CapeFLYER, a partnership between the MBTA and Cape Cod Regional Transit Authority. Hop aboard and avoid the traffic! These commuter rail trains only run Memorial Day through Labor Day. One trip is made on Fridays, Saturdays, and Sundays between Boston's South Station and Hyannis; making stops in Braintree, Brockton, Middleborough/Lakeville, Wareham Village and Buzzards Bay. No reservations necessary, and bikes ride free. There are three main East-West routes around Cape Cod. Route 6, sometimes referred to as the Mid-Cape Highway roughly bisects the entire peninsula. Route 6 is a four-lane limited-access highway west of Dennis, drops down to two lanes from Harwich to Orleans, and is a two lane surface road from Eastham to Provincetown. Route 6A, is a scenic road along the Cape Cod Bay (north) shore. Loaded with antique and artisan shops. And finally Route 28, a busy mostly two-lane road through the southern part of Cape Cod. The main routes are linked by several busy North-South roads. The Canal Access Road connects the Sagamore Bridge Plaza at Exit 1 and the Bourne Bridge Rotary. This is the most direct route to Falmouth and Woods Hole from Sandwich and the Upper Cape. MA Route 130 (Forestdale Road), connects Exit 2 in Sandwich to Route 28 in Mashpee. MA Route 132 (Iyannough Road) is a major thoroughfare running from Exit 6 to the Central Business District in Downtown Hyannis. This route is four lanes and divided for a good portion. Willow Street connects Exit 7 in Yarmouth with the CBD in Hyannis. This is an easier way to reach Hyannis if you're coming from the lower Cape. Station Avenue connects Exit 8 in South Yarmouth with the Bass River and Smuggler's Beach business areas in Yarmouth and Dennis. MA Route 137 in Harwich (Exit 11) is the easiest way to reach Chatham from the Mid-Cape. On the islands, cars aren't really that necessary. Distances are short, and you've got options. If walking and biking aren't your thing, car rentals and ride shares are available on Martha's Vineyard and Nantucket. As long as you're not bringing a car, taking the boat can be surprisingly affordable! A variety of ferries to Martha's Vineyard and Nantucket have evolved to serve their specific customer niches. There's a lot of options, but if you're bound for Martha's Vineyard, the Steamship Authority is the only ferry that operates year round. It's also the only way to get cars to and from the island. For Nantucket, both Hyline Cruises and Steamship Authority run all year. Hyline also operates the only inter island ferry. During the high season, the Island Queen is another popular choice. Steamship Authority, ☎ +1 508-495-3278, toll-free: +1 508-477-8600. The only ferry line that carries motor vehicles to Martha's Vineyard, and offers hourly departures from Woods Hole to Vineyard Haven year round, with additional departures to Oak Bluffs during the summer. Crossing time is about 45 minutes. Reservations are recommended for passengers, and mandatory for vehicles. Fares for vehicles vary depending on the time of year, and do not include the driver or passengers. Also carries vehicles and passengers to Nantucket several times each day, year round, crossing time is around three hours. SSA also operates a one hour fast ferry from the Hyannis terminal, although cars are not carried on this route. Martha's Vineyard $17 round trip, vehicles $44-91 each way depending on size and season. Nantucket fast ferry $74 round trip. Nantucket traditional ferry $38 round trip, vehicles $140-250 each way depending on size and season. Parking $10-20/day. Hyline Cruises, ☎ +1 508-778-2600. Operates a high-speed, 1-hour ferry from the Ocean Street Dock in Hyannis to Oak Bluffs, as well as a 2-hour 15-min traditional ferry during the summer months. Both options cost significantly more and take longer than departures from Falmouth and Woods Hole, but considering the time, gas and hassle you'll save driving to the departure point, it may be worth the added time expense. Also operates a year round high speed service to Nantucket on the M/V Grey Lady III, and a traditional 3-hour ferry during the summer. Island Queen, 75 Falmouth Heights Road, ☎ +1 508-548-4800. Operates from Falmouth Harbor every 90 minutes to Oak Bluffs from May - October. This is by far the quickest and most hassle-free route to Martha's Vineyard if you aren't bringing a car - crossing time is 35 minutes dock-to-dock. No reservations required or accepted, although the company does recommend being at the dock 45 minutes prior to departure to ensure you receive a place on the boat. $22 round trip, bicycles are $8 extra. Falmouth-Edgartown Ferry, 278 Scranton Ave. Operating from Falmouth Harbor during the summer months, offers the only ferry service to Edgartown on the eastern end of Martha's Vineyard. Freedom Cruise Line, ☎ +1 508-432-8999. Runs an 80-minute crossing from Harwichport to Nantucket from Memorial Day to Labor Day only. Although departures are somewhat limited and fares are higher than Hyannis, this option may be more convenient for those staying on the lower and outer Cape. Reservations are strongly recommended, as popular weekend sailings can be sold out in advance. Patriot Party Boats. Offers seasonal service to Marhta's Vineyard, alongside their other fishing and cruising options. The boat runs every couple of hours M-F, adding a few extra trips on the weekends. $12 one way, parking $15/day. Over the past few years, the local bus service offered by the Cape Cod Regional Transit Authority has changed focus significantly - expanding from a primarily tourist oriented seasonal system into a year round service that for visitors and residents alike. Places of interest to tourists such as accommodations, beaches, main streets and shopping are well served. One major advantage of these improvements is that it's now possible to get to any town on Cape Cod by bus - including some of the more off the beaten track locations. CCRTA's network consists of seven major, year-round lines: The Sealine, The Villager, H2O West, H2O East, The Flex, The Sandwich Line, and The Bourne Run. The Flex allows riders to board or disembark up to a 3/4 mile "off-route" for double the usual fare. Call +1-800-352-7155 two hours in advance to schedule an off route pickup. CCRTA also has three "trolley" routes that run Memorial Day to Labor Day. The HAT (Hyannis Area Trolley) is a free service connecting Main Street, the ferry docks, Veterans Park Beach, the West End and Melody Tent. Although less convenient, the trolley is much more affordable than parking at the beaches. The WOOSH Trolley operates in Woods Hole, connecting the Steamship Authority docks to downtown Falmouth. The Shuttle is the local route in Provincetown, primarily serving the beaches and Commercial Street. During the summer, service is every hour on the main routes, and every half hour on the trolleys from 5AM-9PM or later, seven days a week. In the off-season, trolleys do not run, although the Sealine, Villager, H2O and Flex offer hourly runs from 5AM-6PM with less frequent service on the Bourne Run and Sandwich Line. There is no Sunday service. All routes have a flat fare of $2 per trip except when disembarking or boarding off-route on The Flex, when it is $4; and the HAT, which is free. Fares can be paid with cash or an MBTA Charlie Card with a "pay as you go balance" (MBTA unlimited ride cards cannot be used on CCRTA). Daily ($6) and monthly ($60) passes are also available - daily passes can be purchased on board, monthly passes are only available from the CCRTA sales office at the Hyannis Transportation Center. There are no free transfers (except between the two halves of the H2O) - purchasing a day pass makes sense if you need to take more than one bus to get to your destination. Seniors (65+) and those with disabilities get half off with proof of age, a medicare card or a Commonwealth of Massachusetts Transit Access Pass. Martha's Vineyard Transit Authority, ☎ +1 508-693-9440, fax: +1 508-693-9953, e-mail: info@vineyardtransit.com. 11 A Street, Airport Business Park, Edgartown. Buses run all over the island. $1 each way per town you go through or buy passes: 1-day $8, 3-day $15, 7-day $25, 31-day $40. Nantucket Regional Transit Authority (NRTA), 3 East Chestnut Street, ☎ +1 508-228-7025, e-mail: nrta@nantucket.net. NRTA operates shuttle service known as "The Wave". The shuttle stops all along the many routes, including the Mid Island Loop, Miacomet Loop, Madaket Route, Airport Route, Surfside Beach Route, Jetties Beach Route, Sconset via Milestone Road Route, Sconset via Polpis Road Route, and Sconset via Old South Road Route. The shuttle fares for routes and beaches are about $2 each way. If you just want to go for a loop around the island or close by to Jetties Beach, the cost is about $1 each way. The shuttles run from about 10AM-6PM for the beaches and about 7AM-11:30PM for other areas. There is a bike rack on the exterior of the shuttles for bicycles. Cape Cod and the Islands are a fantastic place to "spin your wheels"! There's always another lovely ocean view or charming village just around the corner. Everything is pretty flat out this way, and cars don't have quite the same cache here as in the rest of America. The Cape Cod Rail Trail is a paved bikeway that runs about 25 miles between South Dennis and Wellfleet. It connects up with the Old Colony Rail Trail, leading you into Chatham. As another option, the Shining Sea bikeway begins in Woods Hole at the end of Railroad Ave. It's a great connector from here to downtown Falmouth, running about 4 miles mostly along the ocean. Martha's Vineyard and Nantucket are also particularly easy to navigate on two wheels. Most roads on the Vineyard are accompanied by a bike path, and you'll find competing bike rental shops wherever ferries dock. Nantucket is even easier to cycle around, with two-way paved bike paths leading out to Madaket, Surfside, Cliff road, and Sconset. Most bike rentals are available at the Steamship Authority ferry dock. Convenient yes, but your first few minutes will be a pain until you clear the cobbles! You'll certainly be on some equipment bearing a Cape Air or JetBlue logo. Provincetown has seasonal availability, but you should be able to fly between Barnstable, Martha's Vineyard, and Nantucket year round. Cape Cod National Seashore. These 43,608 acres (176.5 km²) includes six excellent swimming beaches, pristine dunes, bike paths, dramatic cliffs, crystal clear freshwater "kettle ponds" and eleven self-guided nature trails. The National Park Service maintains several overlooks and ranger stations. Rangers conduct educational programs for all ages. Cape Cod Baseball League. The ten-team Cape Cod Baseball League is one of the premier amateur baseball leagues in the US. It is free for the fans and played throughout the summer in ten different Cape towns. About one of every seven Major League Baseball players has played in the CCBL. Cape Cod Central Railroad offers a 2½-hour scenic tour from Hyannis to the Cape Cod Canal, as well as evening dinner trains and family brunch trains on the weekends. Kids under 12 ride free on the 2:30PM narrated train. Scenic daily trips only operate during the summer and fall, but holiday trips for Thanksgiving and Christmas are available in the winter. Cape Cod Melody Tent in Barnstable. Cape Cod Museum of Art, Dennis, specializing in Cape Cod artistry. Cape Cod Museum of Natural History, Brewster. Historic Beech Tree, behind 599/605 Main Street, Hyannis (Almost to the end of the one-way Main Street on the left hand side just beyond the Mass Bay store). The historic English Weeping Beech tree is a must-see for the historically interested or for those that just want to see a huge Weeping Beech. This tree has been featured in Cape Cod Life magazine (July 2010) and its history is amazing! As legend and lore based on historic events have it, the tree was gifted to the town of Barnstable in 1776 by the British Governor of the area "to be planted in the center of commerce" (Hyannis) as a reward for loyalty to the Crown. It seems that the seeds of the Revolution were sown by a Barnstable patriot named James Otis - whose statue is on the grounds of the Barnstable Court House. Within a year, he was attacked by British Revenue Officers and sustained a major head wound. Whether this fear tactic worked or not is unknown, but Barnstable, in 1776, was the only town on Cape Cod that did not vote for independence from the Crown. When coming to see the Weeping Beech, visitors can relax with a cocktail in the Beech Tree Garden Court under the tree's sweeping canopy. With shops and restaurants close at hand, this is a "one-stop" destination. If you've got an ornithologist in your party, consider looking into offerings from the Massachusetts Audubon Society. They offer all-day cruises to Cuttyhunk and Penikese Islands every Sunday for six weeks, starting in September. These islands are owned by the state and today serve as bird sanctuaries. Visit Monomoy Island, a national wildlife refuge just off the coast of Chatham. It's actually two islands, and you do need a special permit to visit. Lucky for you, there's one operator licensed to make the trip; all you'll need to do is supply up to 12 warm bodies. Hiking, fishing, birding, and enjoying the beauty of some of Cape Cod's most secluded and untouched beaches are all possible here. Beaches Explore the beautiful beaches of Cape Cod. Cape Cod Canal Bikeway a paved bike trail on both sides of the canal. It is maintained by the Army Corps of Engineers. Boating and Water Sports - Parasail in Falmouth, Yarmouth, and Provincetown. Fishing, both freshwater and saltwater. Geocaching is a popular activity locally with many caches available. Play with your Cape Cod friends: At municipal courses, residents of that town usually get a break on greens fees, and in many cases if a resident books a tee-time for their foursome, everybody in the group gets the lower rate. Additionally, if your friend happens to be member of a fully private (i.e. not open to the public) country club such as Oyster Harbors, they can bring you as their guest for free. Play mid-week: Fees are usually $10-20 lower Monday-Thursday, it's also easier to get a good tee-time. Play in the afternoon: If you're willing to tee-off after 1PM (instead of the more typical 7AM), rates drop about 25%. Some courses discount greens fees even further after 3PM or later. Play Par 3: Often overlooked are the Cape's several Par 3 (sometimes called a "Short Course" or "Pitch and Putt"). These courses are maintained to the same high standards of their Par 72 counterparts with many of the same amenities and beautiful scenery. Additionally, they are also quite challenging (your short game will really be put to the test!) Fees at Par 3 courses tend to be much lower, and playing in the afternoon can be ridiculously cheap. Holly Ridge Golf Club in Sandwich was featured as a "Best Place to Play" by Golf Digest and is also home to an excellent free summer clinic series. Play nine holes: Many courses will let you play the back nine in the early morning (when most foursomes are just starting on the first tee) at a substantial discount. Skip the cart: Almost every golfer on the Cape uses a cart, but usually there's nothing saying that you have to. If you're physically able to walk the course, it's great exercise and will save you $20 or more per golfer. A handful of courses do require carts at certain times (e.g. summer weekends) - check with the pro shop when you book your tee-time. Play in the offseason: Some (typically municipal) courses on the Cape are open year-round. During the winter season (November–March), golfers are typically offered substantial discounts, as well as a more peaceful experience and the ability to just "show up and play" (in fact, many courses do not even book tee-times come winter.) Cape Cod winters are not usually that cold, just remember your jacket! 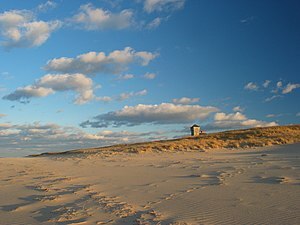 Hiking: Almost any beach can become a perfect hiking trail, of particular note Sandy Neck Beach in Barnstable features miles of walking trails right through the dunes. Tennis - There are many tennis clubs scattered across Cape Cod. In Dennis, Mashantum Tennis and Sesuit Tennis are two clay court clubs worth visiting. The former, hidden in woods away from crowds, features fabulous red clay courts. Theatre, Cape Cod has a large number of theatres—one in nearly every town as well as a number of festivals including the Provincetown Fringe Festival and Eventide Arts Festival. Whale watching Excursions from Barnstable and Provincetown. Cape Cod Community College, ("4C's") in West Barnstable is the Cape's single institution of higher education. Those looking to study on Cape Cod will find the college as a friendly place to embark towards their goals, with associates degrees and certificate programs offered. For visitors, the summer semester offers a wide array of credit and non-credit opportunities excellent for those looking to get ahead in their studies elsewhere (credits are transferable) or for an enriching summer activity. Although financial aid is not available for visiting students, tuition is surprisingly affordable for MA residents, with tuition waivers available for senior citizens, veterans, and high school students who scored well on the state MCAS exam. Through agreements between 4C's Office of Advanced Studies and several Boston area colleges and universities, such as UMASS, Suffolk, Boston University, and Bridgewater State College, it's now possible to complete an entire bachelors degree and even some graduate programs without ever leaving the Cape. Programs in Business, Communications, Education, and Nursing are offered evenings during the academic year on the 4C's West Barnstable campus, and the degree awarded is from the partner institution. Cape Cod Conservatory, in West Barnstable and Falmouth, offers private and group instruction in music, along with classes in dance, drama, and visual art. Summer programs for children are available. In addition to their full season of productions each year Harwich Junior Theatre also offers classes year-round in acting, musical theater, playwriting, improv, and theater tech for children and teens. Golf: Many courses on the Cape hold clinics led by a PGA or LPGA Pro for golfers of all abilities. The reasonably priced (usually $20 per session or less) and informal setting are the preference of most Cape resident golfers looking to lower their score. Most facilities offer a weekly or bi-weekly series during the summer, with each session working on a different skill (such as driving, short game, or putting). There are free clinics offered by the Holly Ridge Golf Club two Saturdays a month from May until September. No advanced registration needed, just show up at 8:30AM the day you wish to attend, but you do need to bring your own clubs . One-on-one instruction to improve your game: Any course that's open to the public should offer private lessons with a pro. $45-50 for a half hour is standard with discounts usually available if you're a member or purchase a block of several lessons at a time. Call the pro-shop for prices and scheduling. Sailing: Several Yacht clubs offer beginning sailing programs, although you may need to be a member or know somebody who is one. Sailing lessons for youth are also available through some town recreation departments, and are usually open to non-residents. Town recreation departments also offer a range of outdoor programs and classes including swimming lessons. These are open to non-residents (although resident families have priority in registering). The YMCA of Cape Cod and the Islands offers an array of summer camps and programs for all ages through their Camp Lyndon Facility. Visitors who belong to any New England Y have reciprocal access (including free use of the fitness center and pool, as well as paying member rates for classes and programs.) Y members from the rest of the US or Canada get 50% off the day-pass rate. As is commonplace for a New England area, seafood restaurants are a regular sight. There is no shortage of restaurants in the entire region, both seafood and not. Wellfleet is well known for its shellfish, particularly oysters. At one time oysters were actually shipped there and put in the harbor to get the "distinct flavor." Cape Cod is home to many different types of places to grab a drink. There are all sorts of bars, pubs, restaurants with bars and so on. Nearly all are open in season (typically June–August), many are open for extended periods (April–October, for example) and fewer are open year-round. In the off-season it would be wise to call ahead or check the Google or Facebook profile of the establishments you are hoping to visit before making the trip. Like the rest of the country, the drinking age is 21; generally patrons who look under 40 will be asked to show ID. If your only photo ID is an out-of-state driver's license, you may encounter some difficulties purchasing adult beverages. State law is very specific in allowing only the following forms of ID as legal proof of age for alcohol sales: (1) a Massachusetts drivers license or non-driver ID card; (2) a US passport book or card; (3) a foreign passport; or (4) a US military ID. In the past, many bars wouldn't serve to out of state patrons at all, or only those from a neighboring state such as Rhode Island or New Hampshire but now it is common for out of state licenses to be accepted when presented with a second form of ID (which doesn't need to have a photograph, a credit or debit card in your name is usually good for this purpose). Individuals using a passport or military ID as proof of age should also be prepared to show backup ID, even though state law specifically allows those forms of IDs as primary proof of age. Cape Cod has a very large number of accommodations ranging from basic motels to plush spa resorts. Resort areas include Chatham, Hyannis and Provincetown. Many hotels are only open seasonally (April through October) and that prices can increase dramatically during the summer high season and during festivals. Cape Cod is also home to several campgrounds. One of those is the Bourne Scenic Park. The Bourne Scenic Park is a campground under the Bourne Bridge on the canal. It is a popular site that permits tent camping and trailers. It is also right next to the canal with easy access to the bike trail. The area along Route 6A in North Truro, just south of the Provincetown line is, for connoisseurs, the real Cape. This is "roughing it indoors" - the accommodations are not fancy - usually just one room, perhaps no kitchen or no drywall wall surfaces, and not very modern. For some, this is the real Cape—all the stuff south of the "elbow" is civilization. You have to go to Wellfleet, Truro or P-town to get beyond it. Hyannis, is perhaps the Hub of Cape Cod. On the Main Street and the Waterfront you'll find Hyannis Harbor, the Village Green, the John F. Kennedy Hyannis Museum, the JFK Memorial Park, the Cape Cod Maritime Museum, waterfront restaurants, ferries to Nantucket and Martha's Vineyard. Deer ticks carrying Lyme disease are a real concern, especially in warm weather. Stay out of dune grasses and brushy areas. If you get a ring-shaped rash and/or a flu-like ache, seek medical treatment. Nantucket has the highest incidence of Lyme disease. Mosquitoes have become a concern in this area as there have been cases of Eastern Equine Encephalitis. Use insect repellent when appropriate. Poison ivy is widespread on Cape Cod and the Islands. The vines of shiny three-leaf clusters run along the ground or climb bushes and trees. Contact can cause intense skin irritations. State law requires children under 13 to wear helmets while bicycling. All children 12 and under are required by law to wear a U.S. Coast Guard approved PFD (Personal Flotation Device) when on a boat. All individuals over the age of 12 are required to have in their possession (aboard the boat) a USCG approved PFD or floating seat cushion. It is recommended that they are worn, but not required by law. Anyone water-skiing, wakeboarding, rafting, or in any way being towed behind the boat must be wearing a PFD at all times, regardless of age. Check the local weather and file a float plan with a friend before leaving the dock. Check the local tides before leaving the dock as many places on the Cape cannot be accessed at specific times during the tidal cycle. WMVY, 92.7 FM, on Martha's Vineyard, one of only a handful of independent radio stations in the country. Return to Boston, capital of New England. Explore the whaling city of New Bedford, and don't miss out on the Portuguese cuisine. How will you remember your time in New York City? Keep exploring in the footsteps of the Pilgrims in Plymouth, Massachusetts. Compact and walkable, Providence proudly shows off its "creative capital" to locals and visitors alike. This region travel guide to Cape Cod is a usable article. It gives a good overview of the region, its sights, and how to get in, as well as links to the main destinations, whose articles are similarly well developed. An adventurous person could use this article, but please feel free to improve it by editing the page.